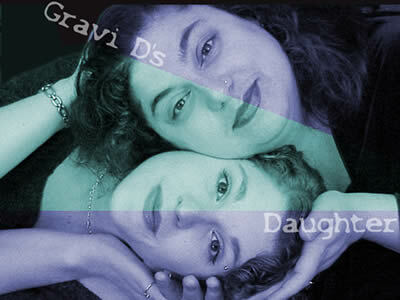 Gravi D's Daughter, a production company of two, Dana Gerringer and Kara L.C. Jones, was conceived when grief got tired of tears, slipped and fell on it's behind, and landed in a pile of humor. "maxi-pads, angels, and other winged things . . . " is a piece full of poetry, life altering grief bombs, and two everyday alchemists turning the worst life has to offer into angelic matter and other winged things." What is Gravi D's Daughter? What is maxi pads, angels, and other winged things? Where is the play being performed? How can I arrange to have this play performed for my organization? Are there promotional products available? 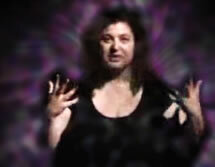 Gravi D's Daughter is the production company started by Dana Gerringer and Kara L.C. Jones specifically to produce the performance of "maxi pads, angels and other winged things..." at the 2001 Mae West Fest in Seattle, Washington. This company will continue to produce performances of this play as long as there is demand for this kind of expressive art. We hope to raise awareness about the reality of loss, long term grief, our society's inability to support bereaved parents, and about Thanatology (sometimes spelled Thanantology) which is the study of death and dying as well as the ethics of grief. We hope to do this without preaching or politics, but instead with love, laughter, and the grief & healing experience that brought us together for this work in the first place. The production of this one act play "maxi pads, angels, and other winged things. .." is borne out of the long term grief and healing processes that happen to women, men, and siblings after the death of achild. We are leaving politics aside in this play and asking audiences to look at the parallels of long term grief and healing that happen when a child is stillborn and when a woman chooses to have an abortion. These kinds of loss tend to be very silent losses. Parents experiencing stillbirth are often told they had a fetus, not a child. They often don't get birth certificates. Family and friend s sometimes don't get that this baby was REAL for the parents. Parents experiencing abortion are absolutely forbidden in our culture to experience and/or express grief. They are implicitly and explicitly told that they chose this, so too bad-- a version of "you madeyour bed, now lie in it." In both situations, the parents often end up "in the closet" about their experiences. But none of the "closeting" nor the minimizations of the child involved change the fact that these parents experience grief. It is our ethical responsibility as a society and as individuals to provide support for the long term grieving and healing processes as they are expressed by each and every family who must endure the loss of a child. We will offer the play script in pdf format soon. This play, "maxi pads, angels, and other winged things..." premiered at the Mae West Festival in Seattle, WA, during the summer of 2001. We had three wonderful performances there and would like to thank everyone with the Fest, especially Heidi, for taking the chance on us and for all your help. As more performances are sponsored and produced, we'll offer you a schedule here. How can I arrange for this play to be performed for my organization? This is a half hour, one act performance of the play "maxi pads, angels, and other winged things..." plus up to an additional hour of workshop time to discuss issues in the play and issues about the ethics of grief in American society in general. 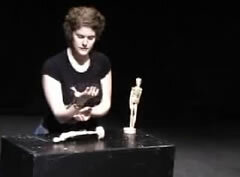 This play looks at the grief process that happens when one family experiences stillbirth and another woman chooses abortions. GRIEF IS NOT A POLITICAL NOR RELIGIOUS ISSUE. We do not present this with a political nor religious agenda. This is to raise awareness about the grieving process and our responsibility as a society to care for bereaved people. Please call us for more details, copy of the script, and sample of the program we make available. Through our association with Zazzle.com, we are proud to bring you the following promotional productions! Show your support of Gravi D's Daughter today! Get your Gravi D's Daughter t-shirt or sweatshirt by clicking the image. Get your Gravi D's Daughter poster by clicking the image. This page is dedicated to Dakota.